The hammer on the left is made specifically for fretwork. The hammer on the right is hardware store variety and does the job pretty well. I could go on and on about fretwork, it too deserves more space than I have dedicated to it here. I’ll just touch on the basics. Fret wire comes either in a coil or in long straight pieces. The coil is okay for softer wire but when it comes to stiffer wire I prefer it to come in a straight piece. I like medium banjo/mandolin wire. It is narrow and tall enough to allow for leveling and crowning, and likely a re-crowning or two in the distant future. The “tangs” on the underside of the fret hold it in the fret slot. To cut the wire to the correct length for each fret slot just lay the wire next to the slot, plan on cutting it a little long. Hold your place on the fret slot with your thumb, use a pair of side cutters to make the cut. I like to hold both the piece being cut off and the parent piece in one hand while I make the cut. Otherwise the fret is likely to go flying off to who knows where, possibly in someone’s eye. I cut all the frets and lay them out in order, and then tap them all in as a separate operation. Be sure to check that all of the fret slots are deep enough before you begin. 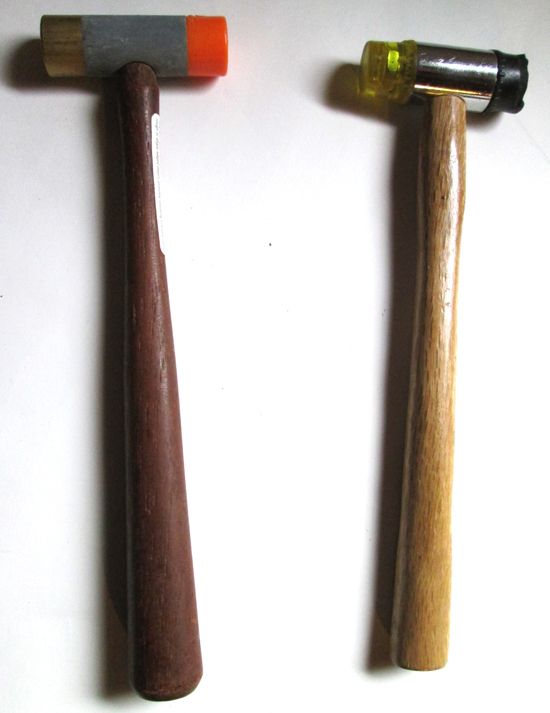 I use a fretting hammer with a brass head on one side and a plastic head on the other. The brass being soft keeps it from marring and denting the frets, the plastic side is even softer. A little practice is all it takes to get good at fretwork. Some luthiers prefer to press the frets in. Some also use a big bag of buck shot to hold the neck in place on the work bench in such a way as not to risk cracking it. I just sit on a stool or in a chair and lay the neck across my legs and use them as a shock absorber. After all the frets are in place there will be little sharp ends sticking out along the fretboard that need to be filed off. Use a long flat file and round over the ends of the frets so they are not at all square or sharp. You will likely be able to feel little sharp corners on them yet. That’s okay for now, they will get their turn with a smaller file after leveling and crowning. I use much the same technique and even the same tool for leveling the frets as for leveling the fingerboard after inlay: a long hardwood scrap, which has been trued at the jointer, with 220 sandpaper stuck on it. Be sure all the frets are seated properly before you begin. 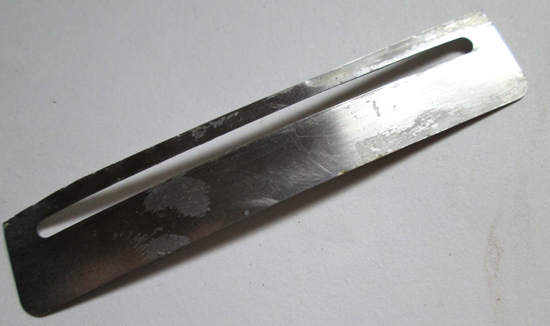 You can see where it has been after every stroke, the highest fret surfaces reveal flat spots. Go easy and slow. After all the crowns look a little less shiny you will know that you have touched them. To see if they are all level, lay the straight edge of a ruler across the frets, if it rocks you know that there is a high fret. If you find a high fret take a good look at it to make sure that it is fully seated in its slot. If it is fully seated use your leveling block to get all the frets level and check again. There are a wide variety of tools available for crowning. It can be useful to tape off the fretboard or use a guard of some kind when crowning as it is easy to gouge the fretboard. Work off the squareness on the crowns left by the leveling. Then run your fingers up and down the edges of the neck and feel for sharp edges. A needle file comes in handy here. I have one which I modified for the job. It has a safe edge with no file on it which allows me to file the fret right up to the fingerboard without filing into the fingerboard. 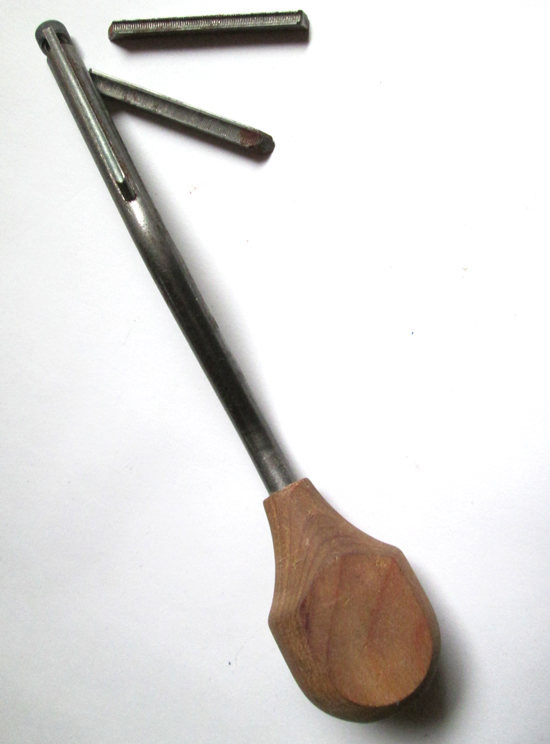 Care still must be exercised when using this tool as it is easy to mar the wood surrounding the fret. After all that, buff the neck with some fine steel wool. This will shine the frets, clean up the finger board, and brighten the inlay. Use a guard to keep from marring the fingerboard when crowning. 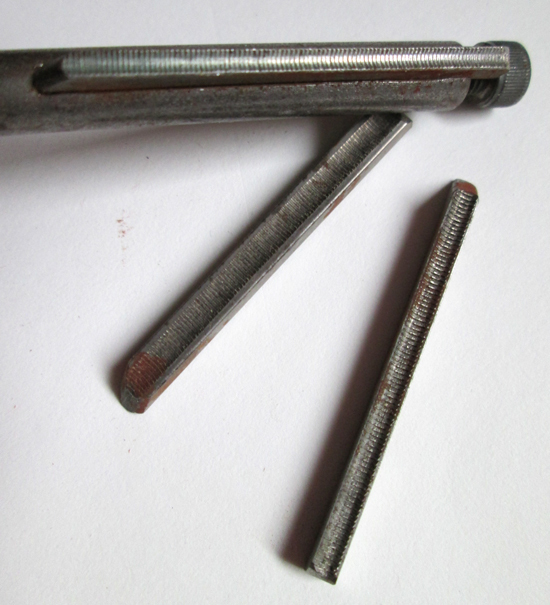 This fret crowning tool has three interchangeable burrs. Interchangeable burrs for crowning different sizes of fret wire. 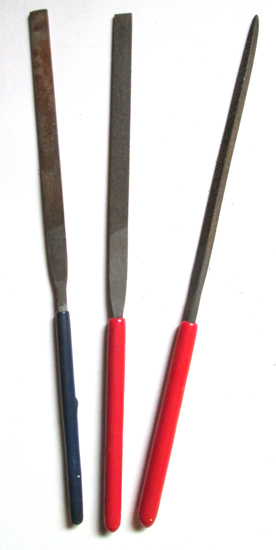 An inexpensive set of hardware store needle files used for filing fret ends. There are more specialized tools available for this job.